The Wadden Sea is located in the South Eastern part of the North Sea. It stretches from Den Helder in the southwestern part along the barrier islands of the Dutch coast, the German Bight and the Danish coast to Blåvandshuk in the northeastern part. 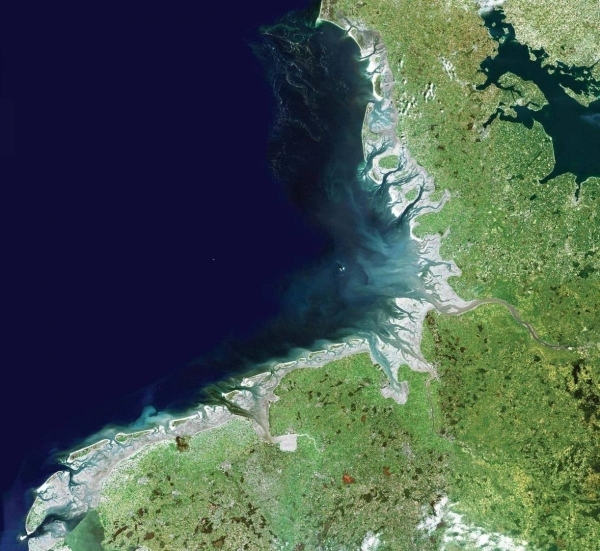 The Wadden Sea is the largest unbroken system of intertidal sand and mud flats in the world, with natural processes undisturbed throughout most of the area. It encompasses a multitude of transitional zones between the land, sea and freshwater environment, and is rich in species specially adapted to the demanding environmental conditions. It is considered one of the most important areas for migratory birds in the world and is connected to a network of other key sites for migratory birds. Its importance is not only in the context of the East Atlantic Flyway but also in the critical role it plays in the conservation of African-Eurasian migratory waterbirds. In the Wadden Sea, up to 6.1 million birds can be present at the same time, and an average of 10 to 12 million birds pass through it each year. The international Wadden Sea, shared by the three countries, The Netherlands, Germany and Denmark, is a good example of LT&C. Why is explained by Dr Harald Marencic, Deputy Secretary of the Common Wadden Sea Secretariat. Tourism is a worldwide economic driver and in particular in coastal regions. This implies a major societal responsibility for the protection of nature and protected areas. LT&C is an important initiative to demonstrate examples from around the world regarding how tourism is meeting this responsibility. And it can illustrate the win-win potential of partnerships between conservation and tourism. 2. Why is your case a good example of LT&C? The Wadden Sea extends over three countries, the Netherlands, Germany, and Denmark. In 2009 it was inscribed on the UNESCO World Heritage List and is one of the largest tourist destinations in Europe. For more than 30 years the governments of the Wadden Sea countries work together on trans-boundary nature conservation to the benefits of present and future generation. Tourism actually benefits from these conservation policies as visitors expect intact nature and conservation measures. Thereby the political support for the protection of the transnational Wadden Sea World Heritage has significantly grown over the recent years. Also, the cooperation between tourism and conservation has been strengthened, e.g. through voluntary agreements and by participating in partnership programmes with national parks. With the establishment of a trilateral environmental education programme in cooperation with WWF, public support for the conservation of the World Heritage is envisioned to grow. The tourism strategy for the Wadden Sea is recognized as a model for other World Heritage sites due to the way that the tourism sector plays an active role to implement the World Heritage Convention. In this context all three Wadden Sea states work together with the UNESCO World Heritage Centre in Paris, supporting the programme for sustainable tourism in marine World Heritage sites (cooperation between all 46 such sites). This includes the 2014 established partnership with the Banc d’ Arguin national park in Mauritania in order to improve the protection of migratory birds along the East-Atlantic Flyway. Close cooperation exists also with South Korea in order to exchange experience with protection and management of mudflats. This includes environmental education, information centers, and sustainable tourism. Participation in the LT&C programme is a further opportunity to share experiences with other areas and at the same time profit from their experiences. This entry was posted in LT&C Examples by Peter Prokosch. Bookmark the permalink.